Home > News > Star Struck Students… And Teachers! Star Struck Students… And Teachers! 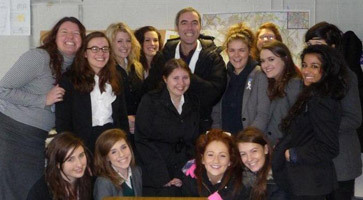 L6 and U6 drama students had a real treat in store when they visited the old LGHS site in Headingley to see a new TV series in the making – and met its star James Nesbitt. Antoinette Keylock, Head of Drama, and drama teacher Beth Harris accompanied the students on a tour of the set of Monroe, a series about a brain surgeon which also stars Sarah Parrish and Tom Riley. Producer Howard Ella told them how he knew immediately that the old school – with its Victorian corridors – was the right space for the set of St Matthew’s Hospital. It took only eight weeks to convert into a working hospital, turning the library into a ward and creating a high-tech operating theatre. The series, produced by Mammoth Screen for ITV1, will transmit in spring 2011.